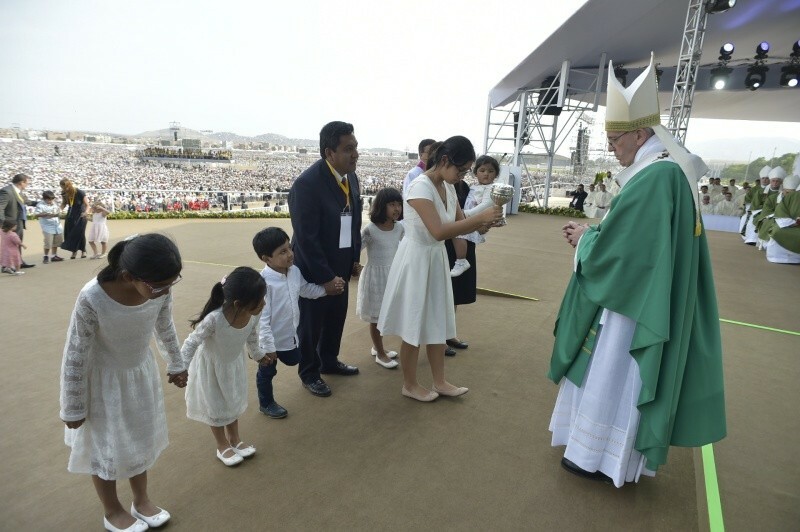 Pope Francis' homily at the Las Palmas airbase in Lima “Arise, go to Nineveh, that great city, and proclaim to it the message that I tell you” (Jon 3:2). With these words the Lord spoke to Jonah and directed him to set out towards that great city, which was about to be destroyed for its many evils. In the Gospel, we also see Jesus setting out towards Galilee to preach the Good News (cf. Mk 1:14). Both readings reveal a God who turns his gaze towards cities past and present. The Lord sets out on a journey: to Nineveh, to Galilee, to Lima, to Trujillo and Puerto Maldonado… the Lord comes here. He sets out to enter into our individual, concrete histories. We celebrated this not long ago: he is Emmanuel, the God who wants to be with us always. Yes, here in Lima, or wherever you are living, in the routine of your daily life and work, in the education to hope that you impart to your children, amid your aspirations and anxieties; within the privacy of the home and the deafening noise of our streets. It is there, along the dusty paths of history, that the Lord comes to meet each of you. Sometimes what happened to Jonah can happen to us. Our cities, with their daily situations of pain and injustice, can leave us tempted to flee, to hide, to run away. Jonah, and we, have plenty of excuses to do so. Looking at the city, we can start by saying that there are “citizens who find adequate means to develop their personal and family life – and that pleases us – yet the problem is the many “non-citizens”, “the half-citizens” or “urban remnants”. They are found along our roadsides, living on the fringes of our cities, and lacking the conditions needed for a dignified existence. It is painful to realize that among these “urban remnants” all too often we see the faces of children and adolescents. We look at the face of the future. Seeing these things in our cities and our neighbourhoods – which should be places of encounter, solidarity and joy – we end up with what we might call the Jonah syndrome: we lose heart and want to flee (cf. Jon 1:3). We become indifferent, and as a result, anonymous and deaf to others, cold and hard of heart. When this happens, we wound the soul of our people. As Benedict XVI pointed out, “the true measure of humanity is essentially determined in relationship to suffering and to the sufferer… A society unable to accept its suffering members and incapable of helping to share their suffering and to bear it inwardly through ‘com-passion’ is a cruel and inhuman society”. Jesus continues to walk on our streets. He knocks today, as he did yesterday, on our doors and hearts, in order to rekindle the flame of hope and the aspiration that breakdown can be overcome by fraternity, injustice defeated by solidarity, violence silenced by the weapons of peace. Jesus continues to call us; he wants to anoint us with his Spirit so that we too can go out to anoint others with the oil capable of healing wounded hopes and renewing our way of seeing things. Jesus continues to walk and to awaken hope, a hope that frees us from empty associations and impersonal analyses. He encourages us to enter like leaven into where we are, where we live, into every corner of our daily life. The kingdom of heaven is among you, he tells us. It is there wherever we strive to show a little tenderness and compassion, wherever we are unafraid to create spaces for the blind to see, the paralyzed to walk, lepers to be cleansed and the deaf to hear (cf. Lk 7:22), so that all those we had given up for lost can enjoy the resurrection. God will never tire of setting out to meet his children. How will we enkindle hope if prophets are lacking? How will we face the future if unity is lacking? How will Jesus reach all those corners if daring and courageous witnesses are lacking?